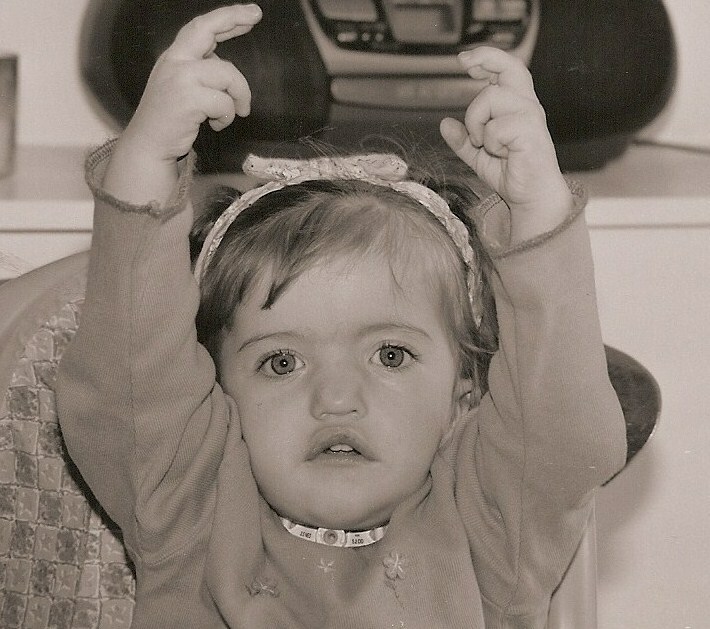 Ella was born in 1999 and was diagnosed as having CHARGE Association, a rare condition that affects the ears, eyes, nasal passages, heart and other things like growth and development. At 9 months’ old, Ella needed a tracheostomy. A ‘trachy’ is a breathing tube situated just below the vocal chords and from the minute it was in situ, she was unable to make a single sound. A few weeks after we got home, her SLT came to visit. She suggested that we start signing using Makaton. I had no idea what she meant – I had only seen those people on telly doing signing for Deaf people. I had never heard of it used in any other way. There was no ‘craze’ for baby signing then and certainly no Mr Tumble! As Ella is fed via gastrostomy (nil by mouth) – we started with motivating, non-food related vocabulary e.g. lots of bubbles, matching animal games and posting little toys into a box. At the time I thought the trachy was only going to be in for a few months, so at first learning Makaton was all a bit of fun to pass the time. When she was just over a year old, the doctors gave us further devastating news – the trachy was going to stay in indefinitely. My signing went into overdrive – if Ella wasn’t going to be able to speak, then this was serious. Soon I was drawing up lists of what signs to introduce, what signs she could do, and what signs I still didn’t know needed to learn myself. Signing could no longer be ad-hoc, I became her teacher. Ella did her first sign by 10 months and by 18 months she had over 80 signs and was putting together little phrases like “where’s daddy?” “go home”, “baby go bed” (she didn’t like the sound of her sister crying!!). 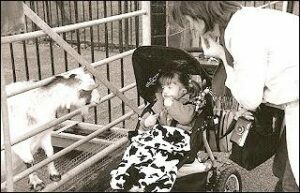 I went on a Makaton Beginners’ Workshop, bought Makaton resources and then plundered the Makaton book ‘Animals, Transport and Vehicles’ so that I could find signs for all the animals and creatures we needed. By 2 years’ old I had lost count of her individual signs as she had several hundred signs in her vocabulary and was stringing them together in superb little sentences. But the signing was more than just about Ella learning how objects have a name. Signing gave me an insight into Ella’s world – her thoughts, her needs, her wants, her sense of humour! Without the signing, our interaction would have been one way with me telling her everything. Equipping Ella with the ability to sign allowed her to develop her own expressive language while also developing her receptive language too. It helped me see past the medical issues and the trachy to the little girl who wanted to tell me something interesting and who wanted to initiate communication. I so clearly remember the day when she woke up from an afternoon nap and signed ‘want book’, and I went to the book shelf and signed back ‘which book’ and she replied ‘red bus book’. A proper conversation. What an amazing day! We were off! 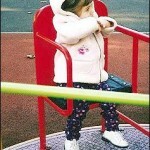 At 3 years’ old, Ella went to hospital to get her trachy removed. As part of the procedure, the doctors put in a smaller tube to see if the child can breathe with the tube blocked off. Some minutes later, we were walking down the corridor – she stopped her rolator – leaned on it for balance, then uttered (and signed)…”mummy it’s difficult to breathe”. She signed the 3 key words mummy + difficult + breathe but spoke ALL of the words, having never spoken before. All that receptive language had been going in, just waiting there for a chance to come out. It was incredible. Once her voice was liberated, she was off! She hasn’t stopped talking ever since! The rest is history. This is why Tracy and I are so evangelical about signing. 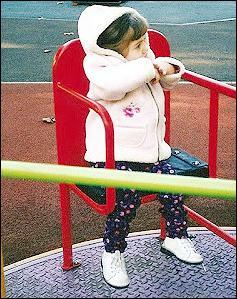 We truly know from first-hand experience what Makaton signing did to help our children communicate. I cannot imagine that Ella’s long-term language and educational development would be where it is without signing. It laid the foundation for her ability to learn language and I’m convinced it has turned her into the voracious reader that she is – all that fingerspelling at a young age clearly helped! But the most important thing above all else is that the signing and her ability to communicate made her happy. It ensured that those voiceless years were not lost years in the development of her desire to communicate with others. Truly priceless.